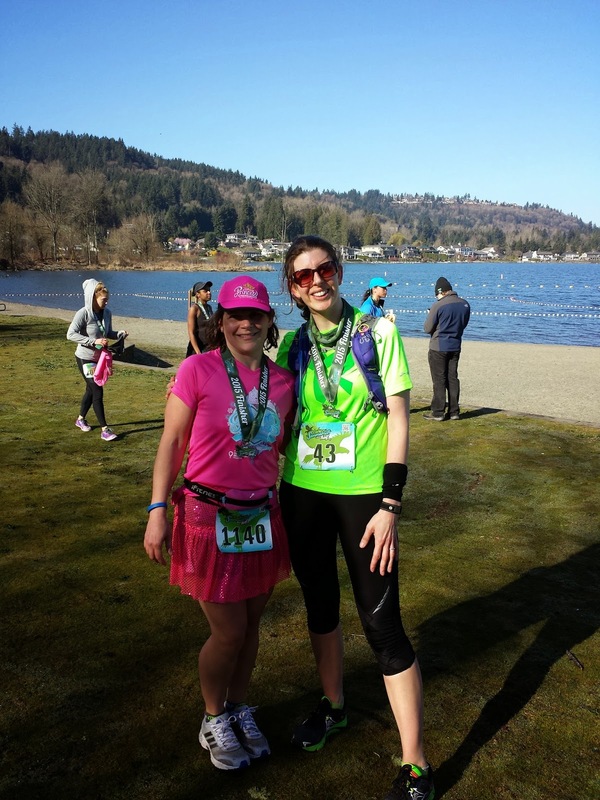 On Saturday March 7th Tara and I ran the Lake Sammamish Half Marathon. We tacked on seven more miles at the end to make 20 miles total for the day. Hooray for marathon/50k training! This was the first time either of us had run this race. I drove over to the start line in Marymoor Park on race morning and Tara walked over from her hotel that was nearby. Traffic was easy peasy! I was parked by about 6:40 or so, found Tara and got my bib and goodies bag from her. She picked both of our bibs up the previous day, though it looks like it would have been easy enough if we had saved it for race morning. Of course, there were some perks for Tara for picking the bibs up at Road Runner Sports! It was pretty cold before the 7:30 start, high 30's. We waited in a short line for what seemed to be plenty of porta potties and then stood around and shivered waiting for the race to start. Since we were using the race as part of a longer training run, we decided to line up somewhere near the 10:00 min/mi pacer and roughly aim for that for the race. The start went off in waves, we crossed the starting mats about 7 mins after the race began. The course itself was . . . okay. It was detoured for a pretty long chunk along the shoulder of Lake Sammamish Parkway because of construction on the Lake Sammamish trail. The shoulder was narrow and at times heavily banked. Not fun. Once we made our way back down to the trail the runners thinned out and we were running on packed gravel. That section was by far the best of the entire course. Photo courtesy of Woodinville Bicycle. This was at mile 5. The temperature slowly climbed during the morning, and once the sun came out about 9 or so miles in it was an absolutely beautiful day. Tara and I appreciated the plentiful water/nuun/clif shot stations along the course, as well. 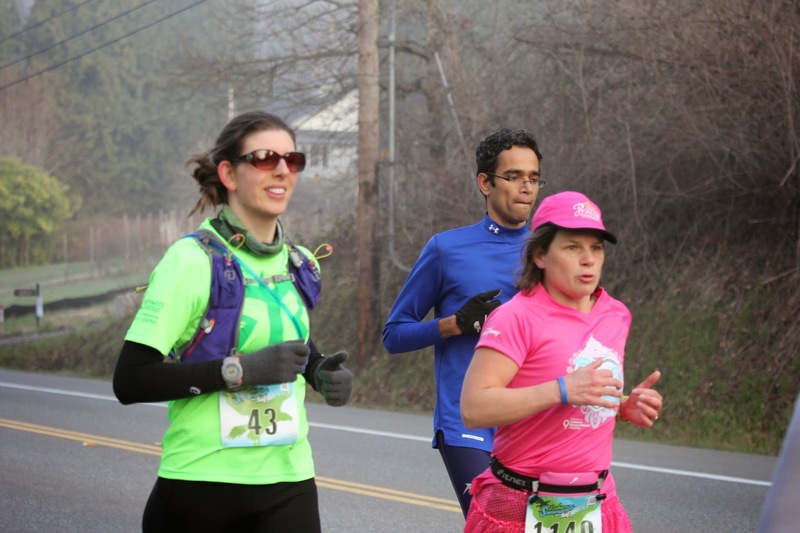 Besides the section along the shoulder of the road, the other major bummer was a one mile weaving up and down along roads in Lake Sammamish State Park, where the finish line was. With one mile to go, and the finish line in sight, you run passed it, back towards it, away from it again and finally get to finish. I would rather see a zig zag like that at the start of the race, not the end! We finished in 2:11:46 Interestingly, it was just 30 seconds slower than the Mercer Island Half Tara and I ran together last year! The medals/shirts/bibs were really cool this year. Of course, I can't wear my long sleeved shirt on account of my long limbs, but it was still a great design. At the finish in front of Lake Sammamish. We found a lot of food and drink at the finish line, grabbing a few things to eat on the spot and a few to tuck away until our entire run was completed. Once we were ready to leave the race we walked to the bus, got right on one, then it drove right back to the start line, where my car was parked. We appreciated that there was not a bunch of waiting around. The race was extremely well organized, which was wonderful. I thought the registration fee was a little steep at $85 total, however. Once Tara and I got back to my car we changed and drove to Cougar Mountain. We were tired, but ready to take on our last seven miles. Despite some challenges, including tight calf muscles and a crazy allergy attack, we had a great time and ran strong the whole way. We finished both runs in a total of 3:51! 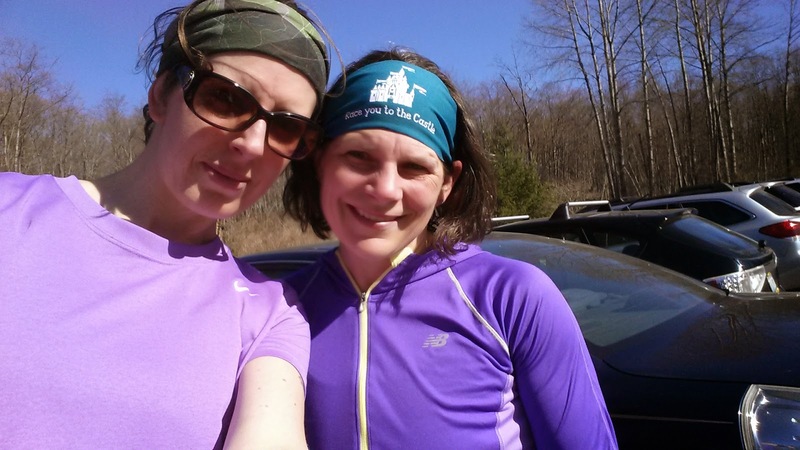 We finished this 20 miler 50 minutes faster than I did last weeks extremely hilly 17 miler-- and I felt much, much better afterwards, too. I think it definitely will help to do a mix of a more flat off-road run and some hilly trails for my long runs. It was a fantastic day of running, and it was so fun to run that long with Tara. We get to do 16 together in three weeks up on Vancouver Island! The half plus seven gave me 37.6 miles for the week with a total elevation gain of 3195.